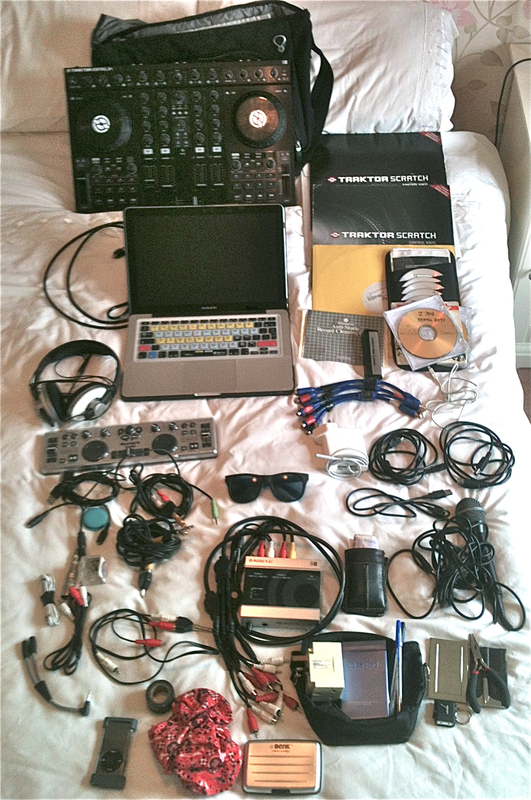 Some of my DJ students ask me what does a digital DJ take to a gig. So, after emptying my own DJ bag out I amazed even myself at the amount of stuff I do cart about. As you can see, I’m clearly paranoid about not having something for that one tricky setup where I could be missing a crucial cable or perhaps the Mac goes A over T, but hey, it still beats breaking my back carrying three boxes of vinyl/CDs about. Samsonite laptop satchel bag, Kontrol S4 controller (occasionally used), Macbook Pro and KB Covers Traktor keyboard cover, Kensington lock cable (to keep the laptop safe from teefs), Traktor time code vinyl (2 x clear, 2 x worn out black one), ‘Skull Scratching’ battle vinyl, sun visor CD holder containing timecode CDs, some backup audio CDs with a few set tunes and backup CD-Roms containing MP3s), vinyl cleaning cloth and carbon brush, 4 USB cables, RCA audio splitters (for those awkward 2 channel mixers), headphones, Numark DJ2GO USB controller (very portable, for emergencies), Mac charger, various RCA, jack and mini jack cables/adaptors, iPod dock audio/charging adaptor, XLR to jack adaptor, spare Stanton cartridge and stylus, spare turntable grounding cable, mini jack to 2 x mono splitter DJ cable, iPod nano, electrical tape, bandana/sweat rag, Native Instruments Audio4DJ interface/DVS sound card and cables, cash/cashcard, business cards in holder, multi mains power adaptor, pocket wind up torch, pliers, tiny multi tool set, AKG microphone, request/note pad and pens, Rayban Wayfarer style shades (with neon blue accents, from McDonalds circa 1987). Akai LPD8 tiny midi controller, spare headphones, DJ insurance papers, laptop stand, pack of funk/hip hop compilation CDs, chewing gum, spare Stanton 500AL and Shure Whitelable cartridges/cartridges in a case (also containing shiny DJ ‘turntable’ bling ring that I never wear and bit o’ paper for fixing records that wobble on the deck spindles) and finally a pair of awesome Sicmat slipmats. Fortunately, all the gear does it’s job perfectly, I can’t remember the last time I had to resort to the emergency stuff. Just as well. A bit of paranoia doesn’t hurt.